A labyrinth is a circular pathway used to walk, reflect and meditate. Labyrinths were created for personal, psychological and spiritual transformation. They have been used for thousands of years for contemplation and prayer. 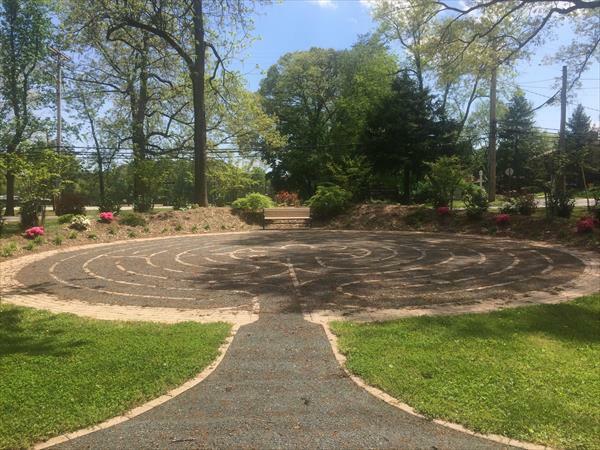 The labyrinth at Woods Church is a modern adaptation of the medieval labyrinth at Chartres Cathedral in France. The effects of walking a labyrinth are profound. Right-brain activity (creativity, imagery and intuition) is enhanced by the act of walking the labyrinth. The journal, The Healing Labyrinth Path reports that labyrinth walking helps balance the hemispheres of the brain, using our physical, mental, emotional and spiritual resources. Labyrinth walking is known to decrease stress. It can be used for healing in grief and promoting focus for those with ADHD (attention deficit, hyperactivity disorder). There is no right or wrong way to walk the labyrinth. Simply clear your mind and relax. Think about concerns or questions you wish to take with you on this walk. Maintain silence throughout your walk. Take your time. If you meet others on the path, step to the side to go around each other. You may acknowledge the other, or simply keep eyes down and focused on the path. This is a time to quiet your mind, listen to your heart and connect to God. Stop for a few moments at the center before using the same path to exit. The Labyrinth at Woods is available to walkers daily. No appointment is necessary. It is located on the Woods Campus, adjacent to the Woods Counseling & Care Center at 8 Cypress Creek Road, Severna Park, MD. For more information contact Nancy Sullivan.